Today we will see Karim Benzema going up against the other half of his top Real Madrid partnership, Mesut Özil. A friendly encounter, for the two club teammates in particular, although France does not see it quite that way. 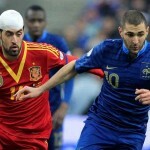 Ozil and Benzema- the Real Madrid teammates will be enemies for day today as France plays Germany in a friendly game. The two Madrid players, with such a good connection on the pitch, will have to take on a different role as the superstars of their respective countries whose historic rivalry does not allow for friendlies. France’s clash with Germany is one of the more mouth-watering friendly matches taking place tonight and meetings between these two sides are always hotly contested. Les Bleus are going through something of a rebuilding process under new boss Didier Deschamps, but have recorded a draw and a win against Spain and Italy in their last two matches. France coach Didier Deschamps has called up Newcastle defender Mapou Yanga-Mbiwa after a thigh injury ruled Raphael Varane out of Wednesday’s friendly against Germany, the French Federation said on Sunday. The uncapped 19-year-old Varane picked up a muscle injury during Real Madrid’s 1-0 defeat at Granada in la Liga on Saturday. France coach Didier Deschamps has called up Newcastle defender Mapou Yanga-Mbiwa after a thigh injury ruled Raphael Varane out of Wednesday’s friendly against Germany. Germany side is depleted with Dortmund trio of Schmelzer, Gotze and Reus set to miss the match. Bayern’s Bastian Schweinsteiger has also pulled out along with Lazio’s Miroslav Klose. Joachim Low has called upon Lars Bender to cover the midfield.